If you're all about relaxed dressing when it comes to fashion, you'll love this on-trend pairing of a navy blazer and a Trask logan bison leather belt. Kick up the cool of your outfit by finishing off with tan leather casual boots. 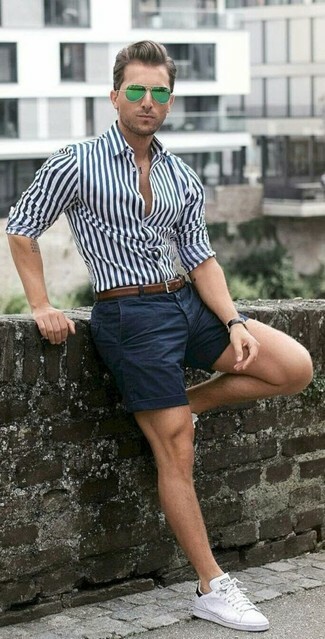 This combination of a white and navy vertical striped dress shirt and a Trask brown leather belt will hallmark your prowess in men's fashion even on weekend days. White low top sneakers will inject a sense of elegance into an otherwise mostly dressed-down outfit. A grey wool blazer and a Trask brown leather belt are an urban pairing that every modern gent should have in his off-duty arsenal. When it comes to shoes, go for something on the smarter end of the spectrum by slipping into dark brown leather brogues. 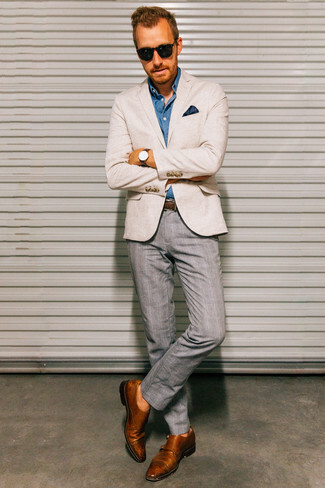 If you're a fan of comfort dressing when it comes to your personal style, you'll love this stylish pairing of a grey blazer and a Trask logan bison leather belt from Nordstrom. To add more class to your ensemble, complete with brown leather oxford shoes. 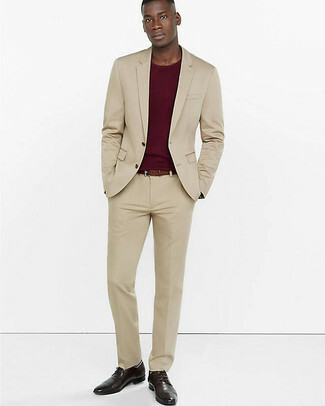 If you gravitate towards off-duty outfits, why not take this pairing of a beige suit and a brown leather belt for a spin? 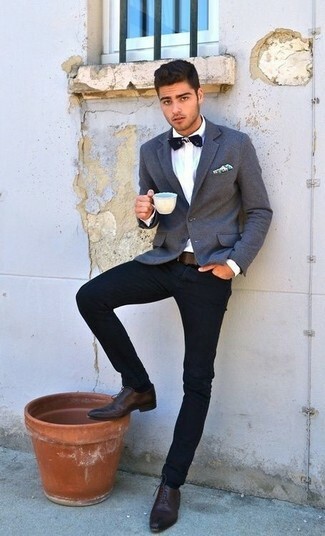 Complete this ensemble with a pair of dark brown leather derby shoes to completely spice up the ensemble. A beige blazer and a Trask Logan Bison Leather Belt from Nordstrom are a cool combination to have in your day-to-day casual repertoire. Finishing off with a pair of brown leather double monks is a guaranteed way to bring an air of class to your getup. Why not choose a beige bomber jacket and a Trask Logan Bison Leather Belt from Nordstrom? Both of these items are very comfortable and look awesome teamed together. A pair of brown leather low top sneakers immediately amps up the fashion factor of any ensemble. 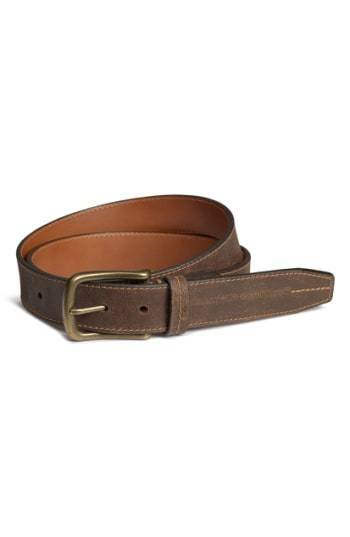 If you prefer relaxed dressing when it comes to fashion, you'll love this neat combination of a light blue dress shirt and a brown leather belt. 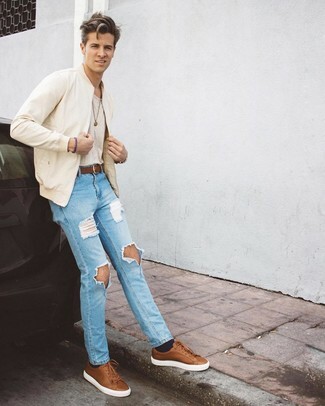 You'll be surprised at how easy it is for any gent to put together this a relaxed casual look. Just a pink long sleeve shirt combined with a Trask Logan Bison Leather Belt. Go ahead and introduce a pair of dark brown leather oxford shoes to the equation for a sense of elegance.